An exclusive country retreat, on an historical family estate, dating from 1848.
of this original farm, over one-hundred and fifty years later. and tranquillity of an age long since gone. Elegant accommodation is available in "THE BOATHOUSE" created from old barns & stables, set beside a secluded lake abundant in birdlife. It contains two spacious, private apartments; each has a bedroom, en suite bathroom, sitting-room with fireplace and kitchenette. 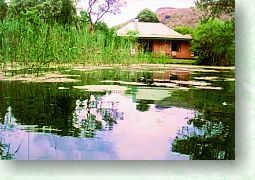 The apartments look out across the small lake where birds abound, onto the beautiful Magaliesberg mountains beyond. Instead of radios and televisions each apartment has its own mini library stocked with a range of interesting books. However for the sporting enthusiasts and TV addicts, DSTV is available in the farmhouse. 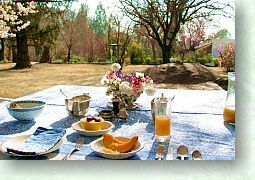 A delicious, traditional country breakfast is served in front of a roaring log fire at the main farmhouse in winter, or on the verandah overlooking the Magaliesberg in summer, accompanied by birdsong and the antics of the almost tame grey loerie family. For dinner, simple self-catering is possible, and there are braai facilities. A few delightful restaurants nearby are also recommended. in an age when these qualities are fast disappearing; for such are the hallmarks of "Dodona". There is an old-fashioned feeling of style and elegance about the place, a jewel for people who want to spend a little time getting away from the madding crowd. "Dodona" is a wonderful weekend hideaway. 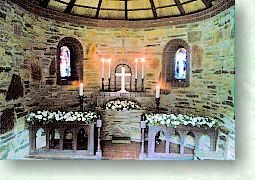 The historic Chapel of St. Francis was consecrated on Easter Sunday 1945 in memory of family and friends who died during the Anglo-Boer and World Wars. Set in its own charming garden with magnificent Magaliesberg views, it is now available for small country weddings and services.